A black Jesus lives, dies and rises again in “The Way of the Cross,” a new book with art by Janet McKenzie and text by Joan Chittister. 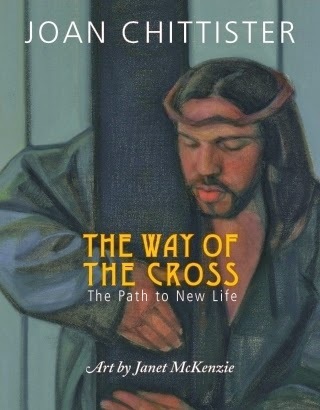 The book is wonderful for personal reflections, especially during Holy Week, which begins this Sunday. It strikes just the right chord for the Passion of Christ today. The optimistic undertone builds to a joyous yet solemn vision of the risen Christ, welcoming with wounded hands as he gazes lovingly at the viewer. 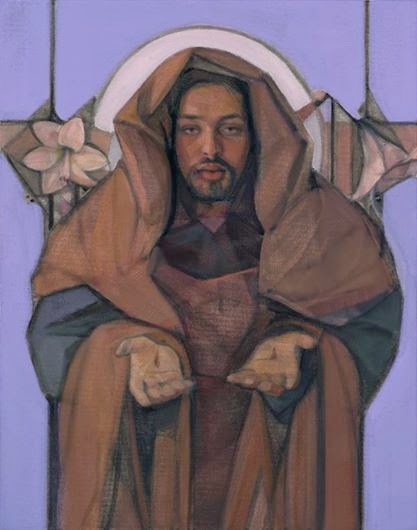 McKenzie, a Vermont artist, got international acclaim (and hate mail) for confronting stereotypes about race and gender when she painted the androgynous “Jesus of the People.” In 1999 it won the National Catholic Reporter’s contest to find an image of Jesus for the new millennium, judged by Sister Wendy Beckett. 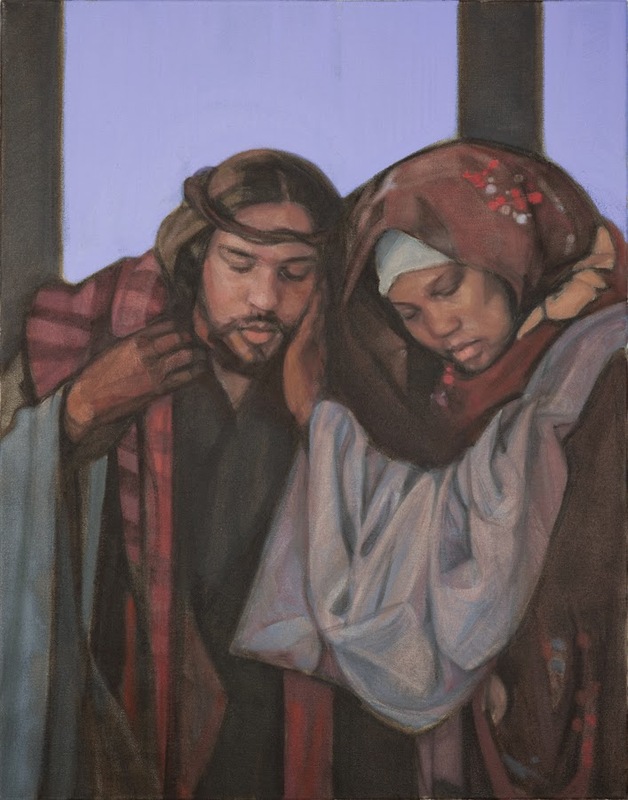 The artist used an African American woman as model for “Jesus of the People,” but a mixed-race man modeled for Christ in her “Way of the Cross.” His African American and Caucasian roots are manifest in different ways in each painting. Chittister, a Benedictine nun and popular author, gives a progressive interpretation to the Passion in her reflections, emphasizing that the cross is a symbol for the suffering of all people. She engages the reader with haunting questions such as: “What crosses do you yourself take on, knowing the risk, understanding the cost and being committed to the consequences?” (p. 25). The book follows the Stations of the Cross, a set of artistic images developed by 4th-century pilgrims retracing Jesus’ footsteps in Jerusalem. Chittister takes pains to find a positive message in each of the 14 traditional Stations of the Cross, transforming what can be a grim subject into something “that reminds us again that there is new life at the end of every daily death.” (p. 13). Indeed the book is subtitled “The Path to New Life.” It concludes with the innovative 15th Station, which was added in recent decades to show the resurrection. In McKenzie’s version Jesus’ eyes are closed until the very last image. McKenzie is known for her paintings of women, and some of the book’s strongest images show Jesus interacting with women: meeting his mother, engaging the weeping women of Jerusalem, being cradled by his mother in an understated modern pieta. “The subjects for Mary and Jesus are mother and son in life, and I believe their profound love for one another is visible, as the love between Mary and Jesus surely was,” McKenzie told the Jesus in Love Blog. The artist and writer seem to have worked independently, for the text makes no reference at all to the imagery in the paintings. The commentary could go with any Stations of the Cross, whether with these images, other images, or no images at all. It is up to the readers to create synergy between word and image in their own hearts and minds. McKenzie builds luminous images by incorporating drawing and line into he oil paintings. All the backgrounds of her Stations are nondescript, giving them an eternal quality outside of ordinary space and time. Most are in meditative shades of mauve and lavender. Each in their own ways the artist and author express a mature spirituality and a depth of understanding about the cross and its implications. It provides many insights about aspects of life that are not usually associated with the Passion of Christ. The original paintings, each measuring 22 by 28 inches, will be displayed at the Cathedral Church of St. Paul in Boston during Holy Week, which coincides with the one-year anniversary of the Boston Marathon bombing. The first exhibition of the new Stations series took place earlier in 2014 with the Dominican Sisters of Sinsinawa, Wisconsin. Between April 1 and Holy Week, they are on view in Arlington, Massachusetts with the Sisters of St. Anne-Bethany. 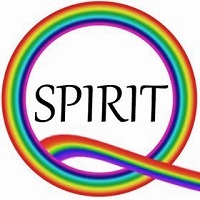 A profile of McKenzie is included in my book “Art That Dares: Gay Jesus, Woman Christ, and More.” It is filled with color images by 11 contemporary artists from the United States and Europe. Many had their work censored or destroyed for daring to show Jesus in liberating new ways. The artists tell the stories behind the images, and my introduction puts them into political and historical context, exploring issues of blasphemy and artistic freedom. My next book will also present contemporary art that takes a liberating look at the Way of the Cross. 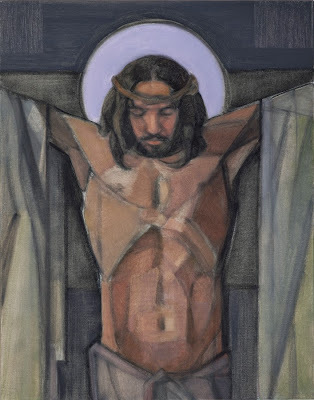 “The Passion of Christ: A Gay Vision” with paintings by Douglas Blanchard will be published in 2014 by Apocryphile Press. Click here to get updates on the gay Passion book.